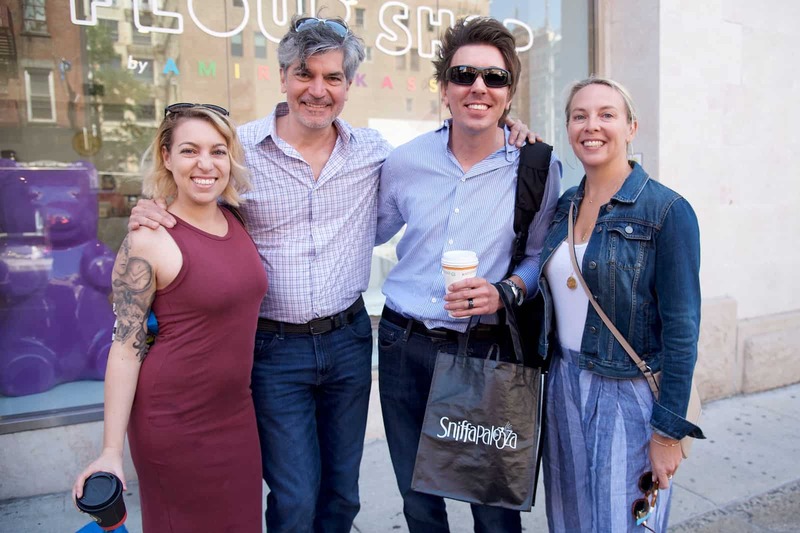 On June 12, 2018, the WFFC gathered for the 11th Annual Fragrance and Flavor Sensory Trend Excursion in New York City organized by Amy Marks-McGee of Trendincite LLC and Jeanine Pedersen. It was a magnificently clear summer day, in fact, the group agreed that it was the most beautiful weather this event has had since its inception. The adventurous group met at 11 am on Lafayette Street. We assembled directly in front of Flour Shop where our host Jeanine Pedersen (Creative Consultant) distributed gift bags filled with swag from our WFFC sponsors. These items included tote bags from Sniffapalooza and Costello Creative Group, a custom candle from Premier Specialties, a WFFC luggage tag, and a luggage handle wrap from Trendincite LLC. Once inside the Flour Shop, we enjoyed our first tasting experience. 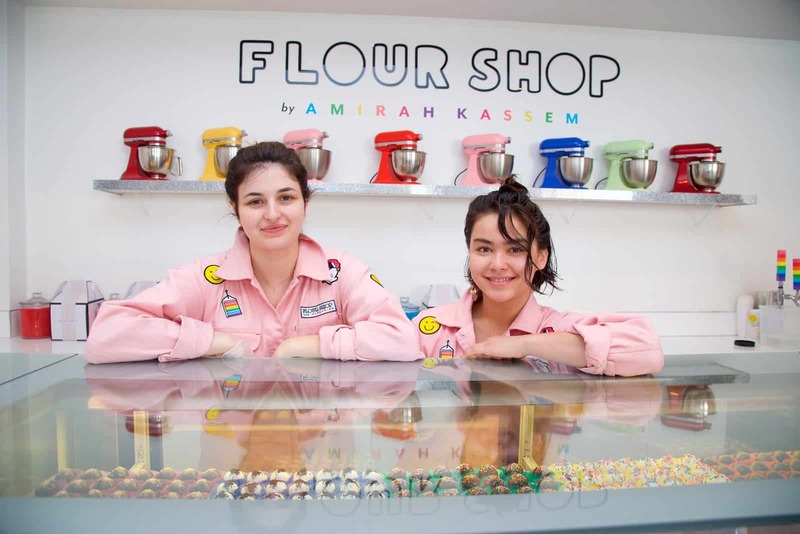 Amirah Kassem founded this retro, fun, and rainbow-inspired sweet shop coined “Home of The Rainbow Cake.” Painted snow white and kissed with a rainbow color palette, Flour Shop had quite literally embraced the unicorn trend. With splashes of color and life-sized gummy bears that stood 3 feet tall in each corner, this boutique bakery is well known for their mini-explosion cakes, drenched in nonpareils, bursting with mini chocolate balls and sprinkles. Each attendee excitedly tasted a slice of the mini-explosion cake. Other available treats included cake pops and a delicious variety of cake balls. What an exciting and cheerful way to begin our day! Full of sprinkles and smiles, our happy go lucky group made way to our next sensorial experience at Perfumarié just a few doors down. Here we had the pleasure of chatting with the owner, Mindy Yang, who recognizes and places entrepreneurship at the forefront of her operation. 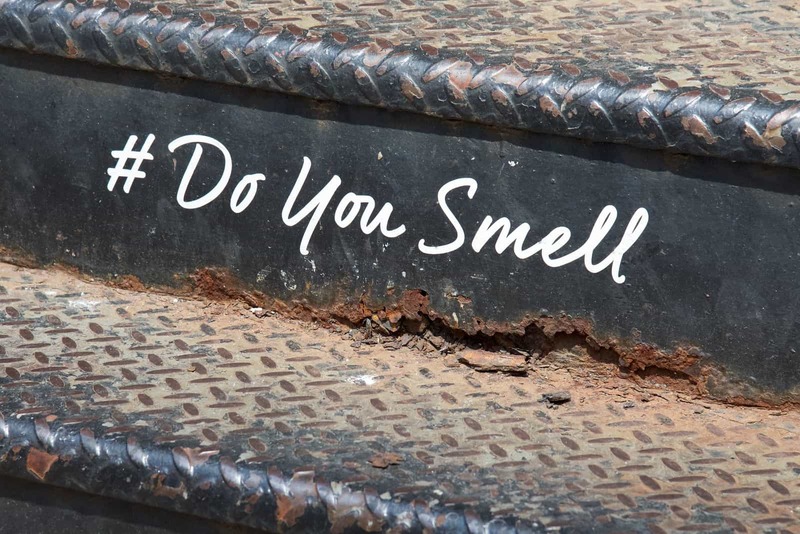 Sporting the hashtag #DoYouSmell, each month their runway showcases up to 32 new mystery fragrances where patrons are encouraged to sniff their way through while attempting to guess the key olfactive ingredients. By removing the packaging, the retail environment, the brands positioning, and any celebrity endorsements, it levels the playing field to better understand what you genuinely adore in a fragrance. It becomes an environment for casual conversation and the sharing of childhood experiences. The fragrance display is divided into thirds. The first third features throwback fragrances from the 80s and 90s, the second third showcases current market fragrances, and the last third highlights up and coming scents that remain unlaunched. This sensorial concept serves as an incubator for both new and existing brands and promotes authentic consumer feedback. Through our individual runway journey, we were encouraged to notate three to four fragrances that we would like to test on our skin. After a quick dry down, each attendee was sent home with a sample of the mystery fragrance of our choosing. And that’s not all. At the end of each month, Perfumeré reveals their mystery fragrances via email. How exciting! After giving our nose all of the attention, the munchies began to set in. Off we went to Canal Street for our third adventure to Bonsai Kakigori. This chilling sweet treat destination nestled inside Canal Street Market, alongside Oba Guys Milk Tea and Snack Bar was a hidden gem. 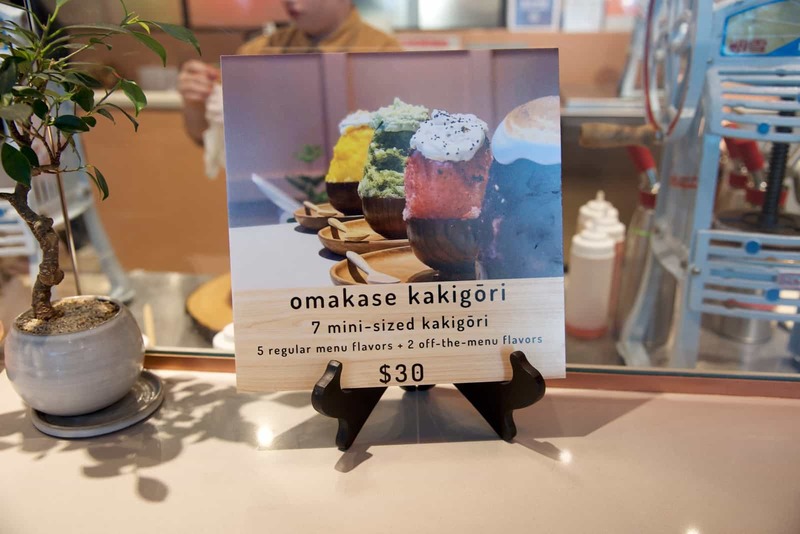 They specialize in the Japanese dessert named, Kakigori, which is built from crystal clear shaved ice, pulverized fresh seasonal fruit, and premium handmade toppings. Their five indulgent menu choices include Coconut Lime Crunch, Matcha Mountain, Strawberries & Cream, PB&J, and Rhubarb Cobbler. The group sampled the Coconut Lime Crunch, Matcha Mountain, and Strawberries & Cream flavors. Each flavor had a unique taste and texture. It was the perfect appetizer for our next stop, lunch at Oficina Latina on Prince Street. 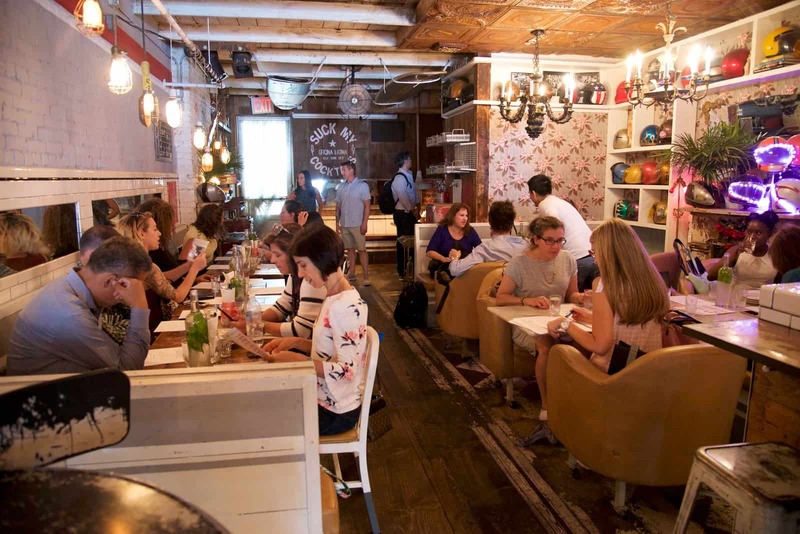 Oficina Latina is a Pan-Latin restaurant that prepares eclectic regional small plates in a comfortable and thematic atmosphere. With a fully stocked bar crafted from crisp white tile and warm wood, outfitted with rustic industrial seating, this restaurant was motorcycle central. With LED backlit helmets, old gas tanks, gothic chandeliers, copper ceiling tiles, and other memorabilia. Our six-course menu included flavors such as Shrimp, Avocado & Onion Arepas; Spicy Vegan Avocado Salad with Cucumber, Tomatoes, Pumpkin Seeds, Onions and Lime EVOO Dressing; Elote A La Parilla (Grilled Corn); Fish Tacos with Crispy Cobia, Shredded Cabbage, Radish Cilantro, Lime, and Sour Cream; Paella Vegetariana Seasonal Vegetables with Saffron and Olive Oil; and finally, Fried Plantains. They have even gone as far as to embrace the hashtag #SuckMyCocktails, available screen printed for purchase on apparel. Maintaining tradition with a quick pause for a group shot (thanks to Dan D’Errico) and with a full stomach, our satiated group strolled next door to Deciem The Abnormal Beauty Company. This beauty boutique was almost quite literally a hole in the wall set in a space an alleyway width in between the two adjacent buildings. 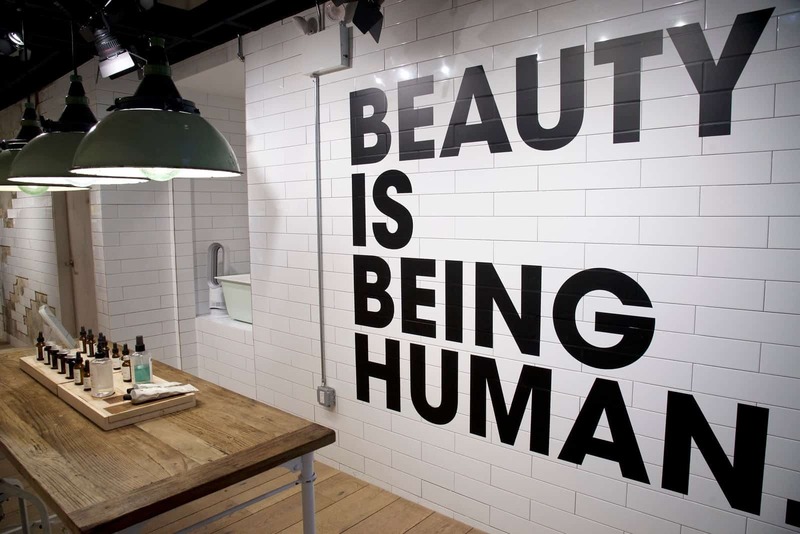 Self-described as “a humble and happy umbrella of good beauty brands, founded on the principle of doing everything others don’t do and changing the world of beauty based on this principle,” the walls were lined in beauty products. With sleek minimalistic packaging, clever color coding, and simple iconography, paired with an incredibly knowledgeable staff, we sampled various products on our skin and we washed our hands with unique body washes and soaps. With the tagline “Fine Fragrance. Fair Price,” our next stop was at Olfactory NYC on Mott Street. This curated fragrance shop is powered by the world’s top perfumers using the highest quality natural, and sustainable ingredients. 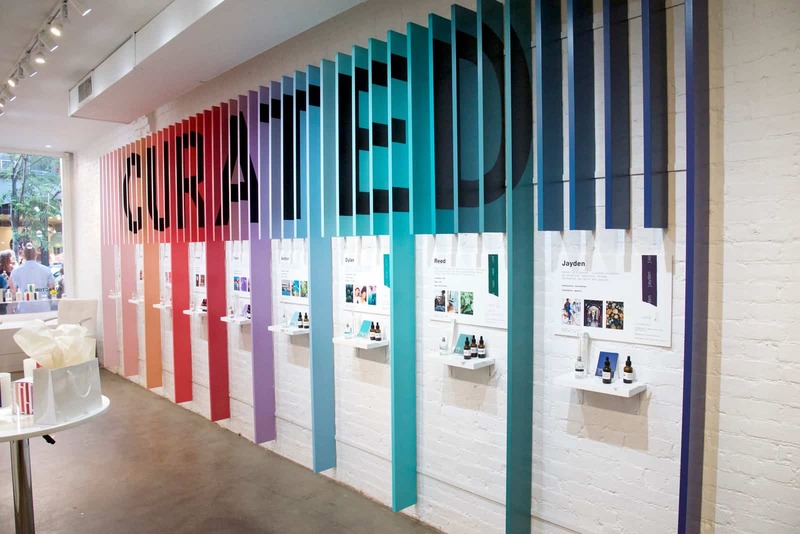 With stark white walls, a polished concrete floor, and a vertically-mounted display that spans the color spectrum, the retail concept is based on nine key colors and personas; five female and four male, with identities such as Avery, Riley, Jayden, and Reed. Each fragrance and persona embodies key visuals and characteristics such as sunny, carefree, and refreshing or ambitious, sensual, and striking. Each fragrance blend has an olfactive descriptor card that explains the fragrance in finer detail, which customers are free to take. Visitors are invited to smell each and purchase as-is or customize the fragrance to their liking with additional accords. Patrons then have an option to purchase the fragrance as a rollerball or in a glass bottle and have it personalized with a name. Candles, body wash, and body lotions are also for sale. Our last and final stop of the day was to none other than Coffee & Cream by OddFellows on Houston Street. With it’s red, white, and blue theme, this quaint dessert shop is considered one of NYC’s best! They feature 12 rotating flavors of ice cream ranging from the classics to more unusual selections such as pizza and cantaloupe. They also serve sorbet, soft serve, and of course, coffee. Each attendee got to select an ice cream and flavor of their choice. This last stop for frozen treats was the perfect way to wind down the long day and the 11th annual WFFC Trend Excursion thus came to a close. With the group in high spirits, I believe I can speak for everyone when I say we all look forward to seeing what’s in store for us next year. What an awesome opportunity for you, George… looks like you had a great time! I’ve always loved going on trend trecks like that. Good for you! Opt-in to receive industry news, marketing, design & communication tips, tools, and resources. We’ll also share case studies that demonstrate how we’ve helped clients elevate their brands and sell their products, services, and technologies. We promise we won’t share your address with anyone. At all. Ever.